When you take your vehicle to an auto mechanic, you should have reasonable assurance that they are reputable and trustworthy, rather than someone who is waiting to perpetrate one of many different auto mechanic scams. Researching a mechanic ahead of time via AAA or other industry resources helps. However, being prepared with knowledge of some of the sneaky car repair tricks those mechanics that are less than honest can help you avoid being scammed. Here are just a few things to look for, and none of them require much more than some basic automotive knowledge. Thanks to WalletPop for some great ideas. Most auto mechanic scams depend upon a customer’s lack of automotive knowledge, and this one is no exception. A mechanic may say that a part needs to be replaced, but the reality is that they may remove it, clean it up, then simply put it back on the car so that it looks brand new. Easily removed parts like batteries, oil filters and radiators are common targets. A variation on this scam can be that the mechanic claims they replaced your old part with a refurbished part. In that case, they’ve literally done nothing. If you can take the car home first before having repairs done, mark the part in question with a small dab of paint that isn’t easy to spot unless someone knows it’s there. After repairs are complete, ask to see the old part as well as the purchase order for the new one. Match the new part with the info in the receipt. If you see the paint on the “new” part, you’ve spotted a scam. Always follow manufacturer suggested intervals for standard maintenance. Check your owner’s manual. The manufacturers know your vehicle model better than anyone, so their recommended specs are authoritative. If a mechanic tries to get you to agree to an oil change, flush or other repair sooner than needed, you’ll have reason for suspicion. Just to be safe, bring your owner’s manual with you when you take your car in for maintenance or repair. If you have ever paid for auto repair that didn’t address the real problem, this tip is for you. Hold your mechanic to a high standard of accountability. If they didn’t fix it the first time, demand a refund or at least a discount on the next repair attempt. If problems persist, try a different mechanic. Check your oil via the dipstick before you go in for repairs. Do this, not just because you want an accurate reading of your engine’s oil level, but because this will remind you to watch for an old nickel-and-dime trick some mechanics use. They’ll only insert the dipstick in part of the way, which will give a lower reading. Sure, it may only be $5 or $10, but that’s something. Also, watch for the detached spark plug trick – it could save you from expensive and unnecessary engine exploratory work. And while you’re at it, don’t spring for the power steering flush. According to WalletPop, no auto manufacturer recommends this service. Sometimes, repair jobs will start with one thing, and then lead to another. 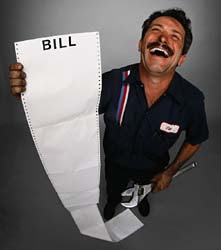 Some auto mechanic scams will center on this common occurrence by doubling your labor charge. If you’re quoted one labor cost, that’s what you should pay in many cases. However, if the new job is something big, the mechanic still has to make money for his or her time. Communicate with your mechanics and make sure they spell out whether additional labor charges will be incurred before you give your consent to proceed.